Peel Out is a 4-player DK minigame found solely in Mario Party 7. The game consists entirely of luck. During gameplay, the player goes down a large, wooden slide in the jungle. There are junctions along the way. The player must tilt the control stick and choose which path to take. There are Bananas and Banana Bunches the player must collect. 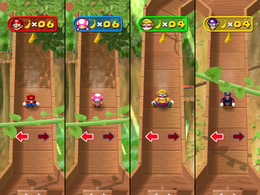 After the minigame, the player who has the most Bananas wins and everyone's bananas will be exchanged for coins. Rules – "Go down the slide and collect bananas on the way down." Advice – "Which slide has more bananas? Only luck can say!" This page was last edited on August 8, 2017, at 17:42.